I wanted to share an article concerning an observation I made on April 20, 1993. It’s a testament that documenting and taking good notes is indeed a good thing! During some recent cloudy weather, while reviewing past logbook entries, I discovered that I had not followed up on an object viewed on 20 April 1993. The main object was NGC 3893, an 11th magnitude galaxy in Ursa Major. While making my sketch of this galaxy, I noticed a smaller, very faint object, SE and very close. I noted this in my logbook as one object to check on later, however, it would be almost ten months later, while browsing through the logbook, that I remembered to follow up on this observation. I checked Burnham’s Celestial Handbook, Tom Lorenzen’s 1000+, and the Tirion Sky Atlas 2000.0 only to find that none of these sources listed a companion galaxy. 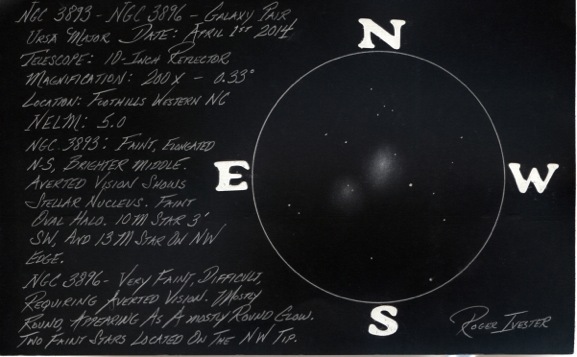 I then went to the NGC-2000.0 Catalog by Roger Sinott, and found the companion listed as NGC 3896, a 14th magnitude galaxy. I was elated, as this was one of the faintest galaxy I had ever observed with my 10-inch reflector from my moderately light polluted backyard. It should also be noted that this observation was made from my back deck, with several unshielded streetlights nearby. If I had not sketched NGC 3893, it is possible that I would have missed NGC 3896. And, if I had not logged the companion, I probably would never have checked any reference material. So, the moral of this story is: Keep a logbook, sketch your observations, and periodically review your logbook. You never know what you may find. After 20 years, I’m already excited about going back to NGC 3893 and NGC 3896…hopefully from a darker site. I wonder how the fainter companion will present itself this time? 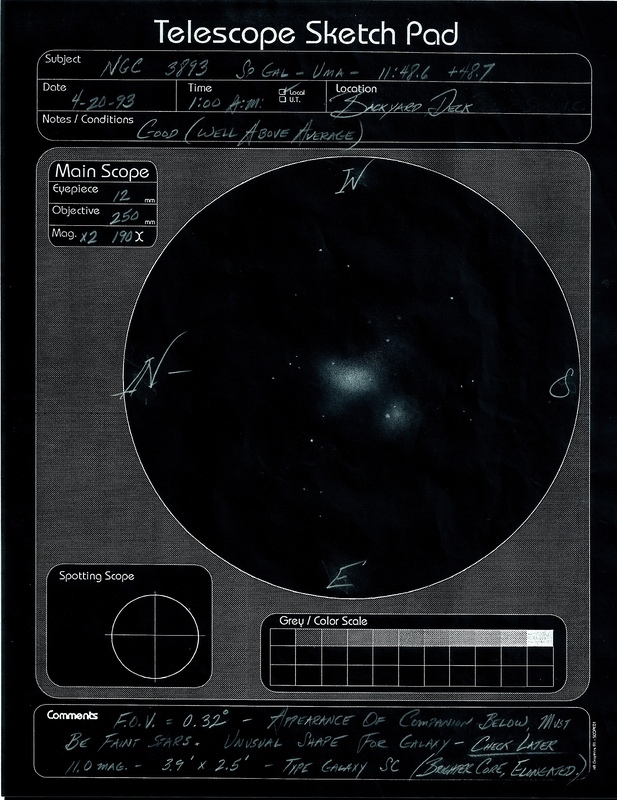 Please note: The following sketch of both NGC 3893 and NGC 3896 is much brighter than the actual visual or telescopic view. This entry was posted on November 30, 2013 at 7:24 pm and is filed under Roger's Articles. You can subscribe via RSS 2.0 feed to this post's comments. Both comments and pings are currently closed.